Spring is here (fingers crossed), and warmer weather means little flats. Right? Right. Our go-to, pre-sandal option: the ballet flat, course. Dive on in for some history—and famous fans. The Origin: Probably obvious, but gonna go ahead and say it anyway: Ballet flats come to us by way of the thin, leather slippers worn by ballerinas. But, thing is, ballerinas actually originally danced in high-heel shoes. 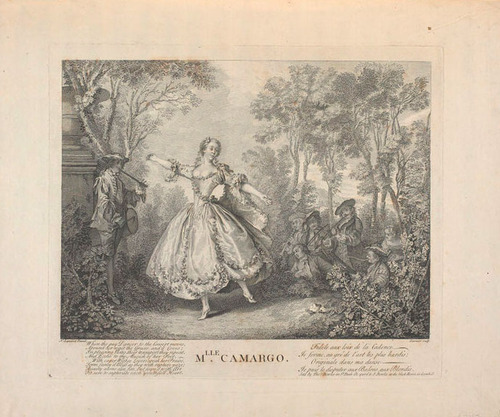 Marie Camargo, above, starts to wear flat ones in the mid 18th century. She also adds tights and a shorter skirt, ushering in a whole new look. The Evolution: And here come those foot-wrecking pointe shoes: Marie Taglioni (another Marie!) becomes the first to dance an entire stinking ballet in them in 1832. In the 1880s, Salvatore Capezio immigrates to America from Italy and sets up his cobbling business across the street from the Metropolitan Opera House. After repairing countless pairs of ballet pointe shoes, he decides he’s gonna get to the root of the problem and improve their design. Capezio’s new shoes are SUCH a hit that in 1910 famed ballerina Anna Pavlova buys a pair for every member of her company. Claire McCardell—the fashion designer responsible for the “American look”—recognizes the potential of the ballet flat far away from the barre and asks Capezio to add a hard sole to its designs, which she shows with her 1941 collection. A decade after Rose Repetto launches her namesake line, her shoes get a real stylin’ ambassador: For her role in And God Created Women in 1956, Brigitte Bardot requests a ballet flat with a durable sole, and she wears the result, the Cendrillon, on- and off-set. Another very-big-deal ballet-flat fan? Audrey Hepburn, who wears them with her all-black-everything look in 1957’s Funny Face. In real life, Audrey’s all about Capezios. After falling out of favor in the sixties and seventies, ballet flats get a comeback in the eighties, c/o Princess Diana, who loves her some French Soles with her more casual looks. In 1999, Jean-Marc Gaucher, former head of Reebok, buys Repetto and shakes things right up. 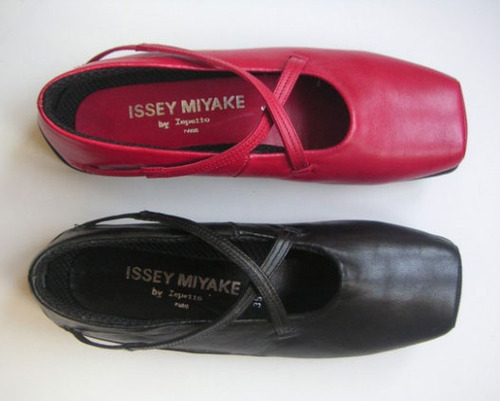 That includes collaborations with Issey Miyake (above), Karl Lagerfeld, Kenzo, and Comme des Garçons. Remember those medallion flats? Welcome to 2005 and the era of Tory Burch’s Reva flats, which achieved cult status after earning an Oprah endorsement. The power of the O: Tory Burch’s site receives 8 million hits in the 24 hours after the program airs. In both tabloid appearances and performances, Amy Winehouse wears her trusty ballet shoes. But she gives the street-ready, hard-sole versions the finger and goes straight to the source, scoring hers from Gandolfi, a dancewear shop in London. The Right Now: Check out the super-cheery version that Alberta Ferretti sends down the spring 2014 runway—it reminds us a whole lot of the shoe’s 19th century origins.